Prostatic Acid Phosphatase ELISA kit-CE-GMP-818-591 3030-USA. 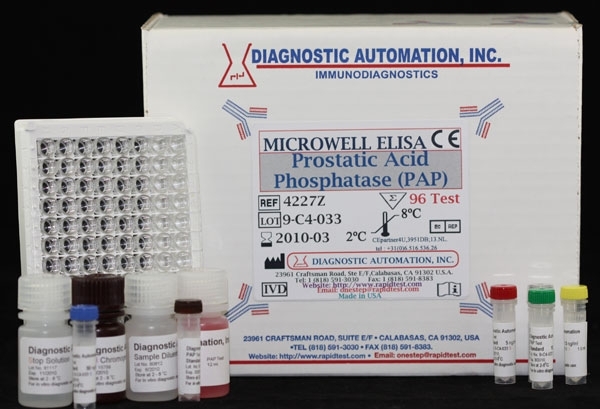 The prostatic acid phosphatase (PAP) ELISA test kit provides a quantitative measurement of PAP in human serum and plasma. In 1938, Gutman and Gutman reported elevated serum acid phosphatase activity in prostatic cancer patients, especially those with bone metastasis. Subsequent studies confirmed that this increased enzyme activity was of prostatic origin; also, the properties of this prostatic enzyme differed from those of acid phosphatase in normal serum. For many years serum acid phosphatase has been measured by spectrophotometric assays based on enzyme activity. These colorimetric methods utilize various substrates, some in conjunction with differential inhibitors of prostatic acid phosphatase. 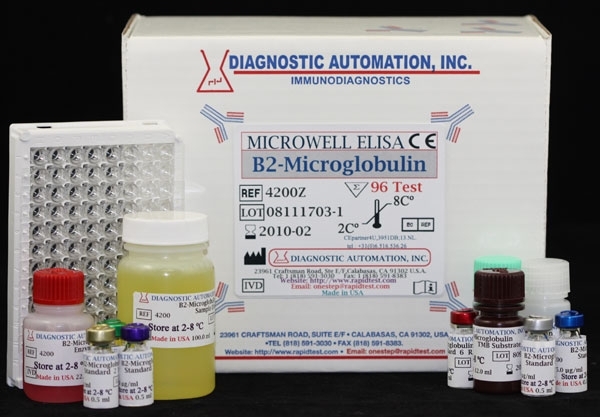 Generally, these assays lack sensitivity or specificity; also, the stability of serum enzymatic activity is time, temperature, and pH dependent. 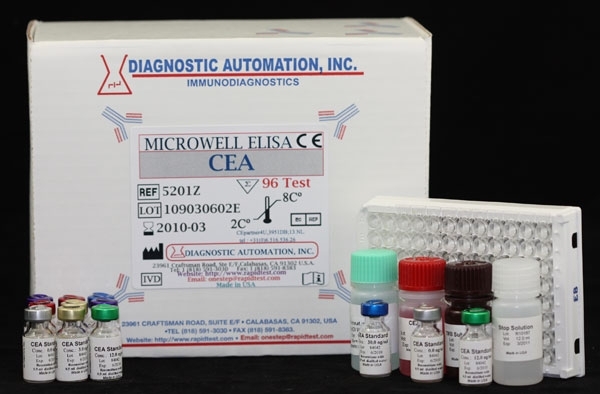 ELISA has been developed to provide a method of high sensitivity and specificity. 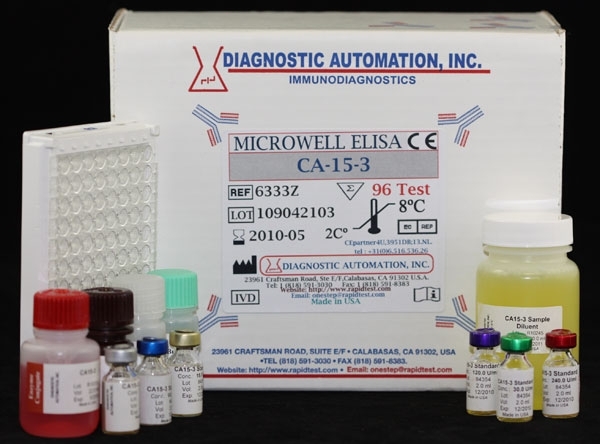 Diagnostic Automation ELISA PAP is a microwell enzyme linked immunosorbent assay based on the sandwich principle. The wells are coated with anti-PAP antibodies. The samples and Standards are incubated in coated wells. During incubation, if antigen PAP is present, a complex is formed on the well. After incubation and washing, the enzymatic reaction develops a color which is proportional to the amount of CEA molecules present in the assay. For additional details please refer to the instructions for use. Product inserts for all Cancer ELISA kits follow a similar method. 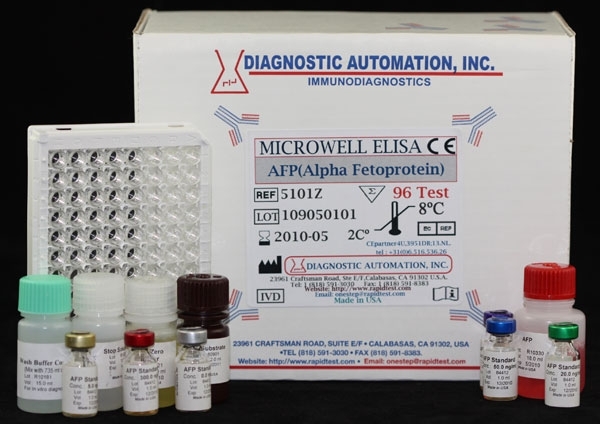 See the PAP ELISA Kit product insert for specific details on preparation, procedures, quality control, and test result interpretation.